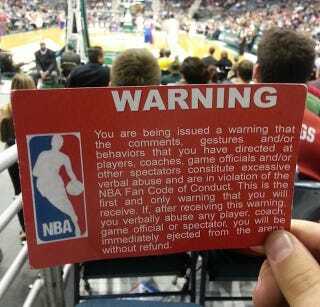 This was posted to Reddit last night by a user who claims that his friend was handed this card at an NBA game. I've never heard of this practice before, and while it gives off a bit of a Big Brother-y vibe, it's better than getting booted from the arena without warning. And honestly, sports fans can be huge assholes who often need to be told to shut up.